The grinder comes in three different colours (Black sesame, silver and cranberry red). They all have different prices, so you might have first decisions to make about purchase already at this point. Design is very good and looks very “classy.” Quality of the product is quite good, however it is not good for French press coffee. It is small and light. It has an LED screen and 25 steps of adjustment. 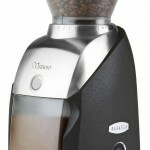 Another great virtue of the grinder is that you can remove the bean hopper with beans in it. It has a great price to value ratio. 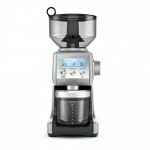 The grinder is in slightly higher price range than Breville BCG600SIL. In order to make ideal performance Breville coffee grinder, you should follow many tips, most important of these tips, the beans are fresh grinding necessary for espresso, you must grind the beans in small batches, avoid beans stored for long periods in silos. Grinding is consistent after you find the right settings. This might take you some time though, although they give you instructions and tips at the purchase to make the settings right faster. Cannot grind French press, because it cannot be adjusted to grind it. 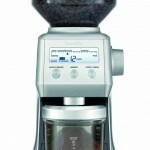 With Breville smart grinder, you can find 25 of the settings of different grinding. There is also an amounts setting where you can set up exactly how much you want to brew. It is measured in cups or shots. Therefore you can set exact amount of coffee that you need to brew. It has a LED screen. 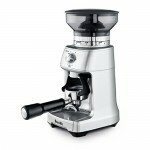 For a price range of around 200$ you cannot expect very silent grinder. However compared to comparable other products, customers are happy with the low loudness that it produces. Wash the Grinds Container and Lid, Bean Hopper and Lid and Porta filter Cradles in warm soapy water, rinse and dry thoroughly. It is a great value for the money. 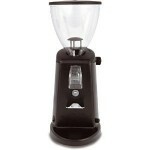 Removable hopper with beans in it is a feature of high-priced grinders. You cannot store beans in it for long time as it is not airtight, but it is still very useful for coffee enthusiasts. 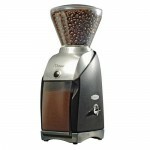 Comes with very helpful manuals and is one of the best grinders for that price. Sometimes comes defected, but warranty and good customer service will fix that. Be careful though if you are making French press, the grinder might not be for you. It also comes in three different colors and has a great design. In general is a goodgrinder. If you need higher settings then this grinder is not for you. French press might not work because of the lack of settings (25). Dark oily beans occasionally get jammed. Also other beans sometimes get jammed.